Beecher’s beautiful new mausoleum is practically finished so far as the interior work is concerned. The marble setters have completed their work, the decorators have touched up the cement ceiling and outlining work with harmonious tints, the formaldehyde vats have been placed and the building will have been cleaned up by tomorrow evening so that on Sunday it will be in presentable condition for visitors and those interested to look over the most beautiful mausoleum constructed in this part of the country. About the only work left to complete the structure is the washing of the outside walls, and this will be done as soon as the weather moderates enough to permit. Then will come the arranging of the grounds, seeding it to grass and putting the walks and driveway into shape. All of which will be under way with the opening of spring. 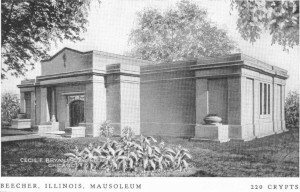 It is expected that the mausoleum will be formally dedicated in May. Messrs. Struve and Thielman are well pleased with the satisfaction the mausoleum is giving those who have purchased crypts and daily learn of new prospects. 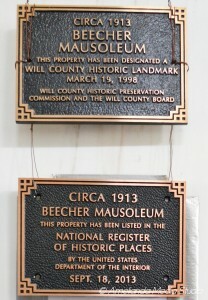 Even visitors from out of town are becoming interested, and last week, two crypts were sold to parties who never lived in Beecher, but who prefer the mausoleum idea of interment. It is expected that from now on many will visit the new building daily, and those who have contracted for crypts are expected to make their selections early. 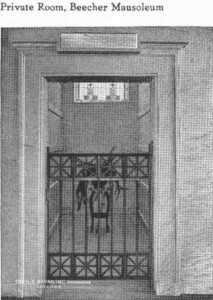 All parties who have contracted for crypts will be furnished with an individual key so they may at any time come and visit the mausoleum and bring their friends along.